Crystal over at MoneySavingMom hosts a Super Savings Saturday Link Up and thought I would participate. I've really been getting into the money saving groove and gotten some great deals this week. I let our cupboards and fridge get really low on just about everything so I was cringing making this week's list. I really lucked out at Dillon's though with the awesome specials they had! Here's a pick of what I purchased. I realized though, AFTER I took this picture and uploaded it, that I had put away 3 bags of Birdseye Steamfresh veggies and 2 bags of Gorton's frozen fish. I had also forgotten about the 10 lb bag of potatoes. The price I paid may still seem like a lot to those of you who rarely spend more than $40-$50 bucks a week. However, if you look close you'll see I got two 3lb rolls of ground chuck, 2 family size packs of boneless skinless chicken breasts (enough for 4 meals), a corned beef brisket, a 1lb bag of honey ham lunch meat (we use for brkfast sandwhiches as well as for lunches), and a value pack of chicken thighs! I got all this for $86.36 and saved $84.32! You may be wondering where some other essentials, like milk, are. Well I stocked up and purchased 4 gallons at $2.88 each on Tuesday before the sale switched. So that should last us a week! lol No, they might last a week and a half! I was so excited when I left Dillon's and started breaking down all the meat into freezer bags. With all I purchased, and a few little things I still had in the freezer, we have enough meals for at least 20 days, and that's not including days we'll do leftovers! I could list all my deals but instead here's the link I used to snag up most of these deals you see in the pic. 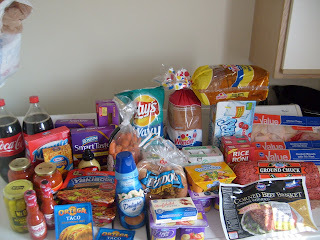 Visit MotherhoodOnaDime for this weeks Dillon's specials with coupon match ups.